It may be the world's 1st spice. Throughout history, there have been many myths and elaborate tales about searching for it around the world. Merchants would tell wild stories about acquiring it that made it sound as though it was virtually impossible to find. These stories, of course, increased the interest, cost and overall allure associated with this spice. It was not until the 15th century that the myths began to subside and the truth about the availability was known. This spice comes from the inner bark of an evergreen. It is grown primarily in Sri Lanka, Brazil, India and the Caribbean. Today, it is readily available in ground and stick varieties. This fragrant spice can be used in both sweet and savory recipes. It is great with almond milk for a healthy treat. It is also good on fruit (e.g. apples, pears) and vegetables (e.g. sweet potatoes, acorn squash). It is used in many recipes for Mulled Wine - one of which can be found on this web-site link Mulled Wine. In stick form, it is often used in coffee or other beverages. You may want to try a recipe for Iced Spiced Coffee or Healthy Spiced Tea. Both use sticks. 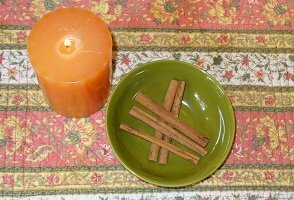 This wonderful spice is great for cooking as well as being an enjoyable scent for candles and many other scented items. It is similar in some ways to cassia. Both are from the bark of evergreen trees. However, the real version is typically more fragrant with a hint of clove. Cassia is often substituted but does not have the same delicate flavor. Today, grinders are available for the freshest taste. Hint: When using in cooking, add later in the process to avoid bitterness.